Hats are as American as baseball, and maybe more popular! Rep your favorite teams, brands, and pop culture icons with a new hat from Lids.com. With over 40,000 caps and accessories in stock, this site is filled to the brim with fantastic options to show off your personality. Outfit your order with a money-saving Lids coupon code and put a cap on the price. A great hat really tops off your look. Whether you love to skate or hoop, Lids.com has the most hip styles to show off your passion. Shop the latest collections from New Era, Adidas, Kangol, Nike, Billabong, DC Shoes, and more. Show support for your favorite MLB, NBA, NFL, NHL, or college team with a designer cap custom fit to your interest and head. You can even create a lid of your own. Lids.com incredible selection of hats will really make your head turn! On top of the caps, the site carries tons of accessories to show off your style. Select from a wide variety of bags, iPhone and iPad cases, jerseys, apparel, sunglasses, and wallets. Lids.com stays up on the latest fashions to keep customers up on the hottest trends. Partners Glenn Campbell and Scott Molander first head Hat World back to the early 1990s. The pair launched a retail store in a shopping mall in Lafayette, Indiana during the 1995 holiday season and sold over 6,000 hats. They built upon their initial success to expand to 157 stores in five years and acquired Lids in 2001. With more than 400 stores and an online store reaching millions worldwide, Lids has become one of the largest hat stores around. At CouponPal, we tip our hats to Lids.com for their amazing deals. Get the hat for you with a Lids coupon code bringing down the cost on the best styles. Lids.com offers many coupons and deals that can be redeemed online for huge discounts and free shipping. 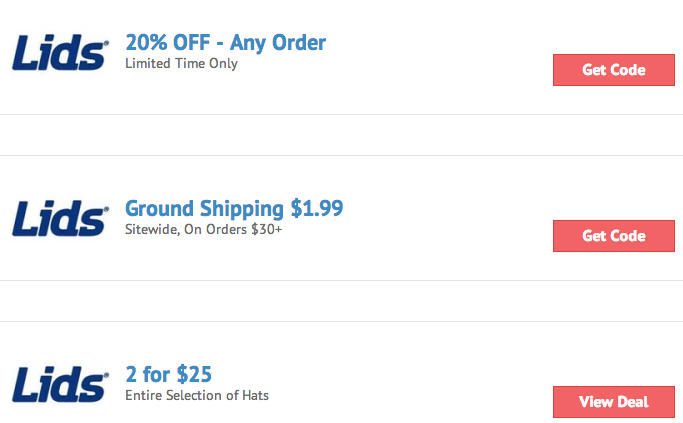 The offers you typically find for Lids.com at CouponPal will not require a coupon code to save. Instead, simply click "View Deal" on the offer you want and a new Lids.com page will open with the selected discount automatically applied to the price at checkout. However, sometimes there will be a Lids.com coupon code that needs to be entered during the checkout process to activate a discount. For deals with a code, here's a step-by-step guide to make sure you get the most in savings. Once you find the deal you want, just click it. This page will redirect to Lids.com and a new window with the code will open. Highlight and copy the Lids.com coupon code in the new window. You'll need this code at checkout, so keep the window open in case you need to copy the code again. A pop-up window will automatically appear prompting you to click on "Secure Checkout" to get to the Checkout window. Click on "Secure Checkout." Enter the Lids.com coupon code at the "Coupon Code" field at the right side of the page. Then click on "Apply." Represent love for your favorite team with a hat from Lids.com. With a huge selection from all your favorite sports, you’ll be able to find the perfect hat for an awesome price. Don’t forget to use your Lids.com coupon code for some sick savings. Here are answers to questions you might have while shopping at Lids.com. Why isn’t my Lids.com coupon code working? 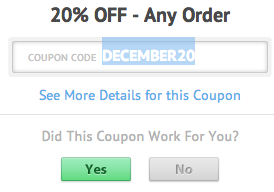 You go to purchase some awesome hats, and your coupon code doesn’t seem to be working. If this happens, look to see if there is an expiration date or minimum size order restriction attached to the deal. These limitations can affect whether your coupon is accepted at checkout. You can reach customer service by calling 1-888-564-4287; representatives are able to answer your questions anytime, day or night. You can also email them at Contact Us. As long as you have the original receipt or packing slip, you can return your items for a refund within 30 days. If you don’t have the receipt, you can receive merchandise credit. If more than 30 days have passed, you can receive a gift card in the amount that the item is currently selling for. After 90 days, returns will not be accepted at all. Also, you cannot return items that have been worn or washed. Clearance items also cannot be returned. If you want to return an item that has custom embroidery, you must contact customer service first.You have the option of sending return items back or returning them at your nearest Lids store. For more details, go to the Return Policy page. If you spend over $50, your shipping is free! If you spend less than that amount, your shipping charges are a low, flat-rate of $4.99. You can also have any items shipped for free if you are willing to pick them up at your nearest Lids retail location. More information can be found at Shipping Options. Lids.com currently accepts Visa, American Express, MasterCard, Discover, and Lids Gift Cards. You can also pay for your orders with PayPal or Bill Me Later. Bill Me Later is a payment method where you can pay for your purchase in monthly installments. What is the Lids Club? The Lids Club is a great way to earn savings on your purchases. For only $5 a year, you can earn 20% off hats and embroidery, 10% off apparel and accessories, and sneak peeks of new merchandise. You’ll also receive emails or texts notifying you of special promotions and events. Additionally, for every $1 you spend, you’ll earn one point. If you earn 300 points within a year, you’ll be upgraded to Lids Club Pro, which lets you earn extra benefits like priority access to limited edition products and VIP events, advanced purchases of special products, and special Lids partner rewards. The Lids Club is an awesome way to get extra rewards every time you spend money in a Lids store or online.